‘Wisdom doesn’t date,’ we’re told about five hours into this epic two-part play charting Cicero’s rise and fall. 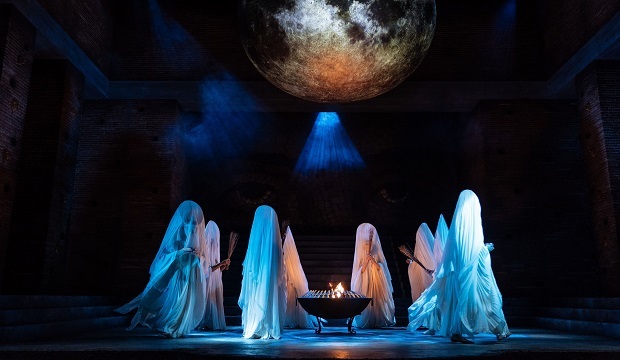 And it certainly rings true as the RSC stage adaptation of Robert Harris’s thrilling book trilogy makes Ancient Rome feel keenly relevant to our world of Trump and Brexit. Transferring to the West End after a sell-out opening at Stratford-Upon-Avon, the plays are a daunting prospect. Each exceeds three hours. If you commit to both, it’s pretty much the same as a long-haul flight, and the comfort of West End theatre seats is only just on par with a budget airline. But those willing to immerse themselves in politics, scheming and rhetoric for seven hours will be rewarded. Ancient Rome's political volatility and compelling characters chime with our own contemporary concerns. Writer Robert Harris described his 2006, 15 book series as 'like West Wing in togas', and Mike Poulton adapts the trilogy with a keen sense of drama. It plays out on a simple but effective stage of steps and stonework. Together, Imperium parts I and II are an extraordinary feat of storytelling – a feast of detail, peppered with comedy, with enough compelling plot-twists to keep you wanting more. There are guffaws as idiotic ruler Pompey sports an all too familiar tango tan and yellow quiff. As the toga-wearing senators concede that ‘stupid people tend to vote for stupid people,’ or as Britain is dismissed as that little place ‘just beyond Europe’ there’s no denying that history repeats itself. Cicero’s slave Tiro (Joseph Kloska), speaks directly to the audience with an easy chumminess and wry asides, updating us on what’s gone on and which Gaius is which. This also means that both part I and II can be enjoyed as stand alone plays. Richard McCabe gives a bravura performance as Cicero. The sheer amount of lines he had to learn is boggling enough, but he delivers them with the flair and fanfare of a true orator. While Cicero’s undeniable brilliance shines from each perfectly-constructed speech, the accompanying hand gestures and smug smiles remind us of his arrogance and hubris. McCabe maintains the pace and eloquence while also appearing to age before our eyes: the cocky newly-elected consul of part one is greyer, and somehow shrunken by part two. It’s poignant to see, and though the domestic moments are never as strong as the political drama, there’s enough intimacy in this epic to make you feel fully invested in Cicero’s plight. If you can't face the full five hours, though, Part I and Part II can be seen, and very much enjoyed, as independent acts.